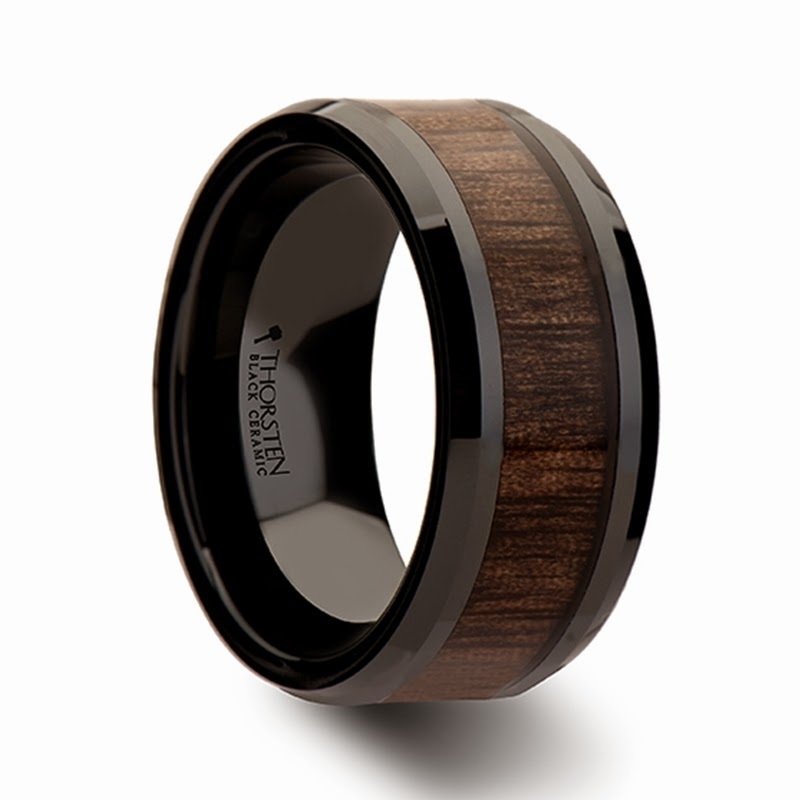 The Yotimo Black Walnut Wood Inlay Beveled Black Ceramic Ring offers the perfect fit of old world charm and new world style. This ring is an ideal fit for the couple looking to stand out uniquely in the crowd. Created from high tech scratch proof black ceramic and gorgeous dark walnut inlay this exotic style from our Black Ceramic Rings line is truly as unique as it is alluring. The inlay is made of 100% real wood and you can tell by the grain of the wood going from side to side. If the grain runs around the ring, this would be a sign of fake wood. The design combines the newest and oldest materials to be used in fine jewelry making. 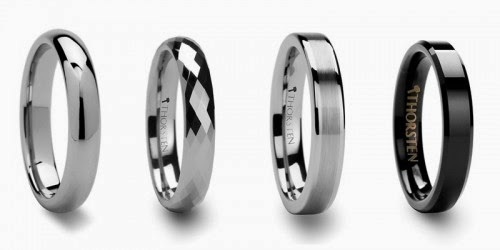 Tungsten men’s wedding bands are quickly becoming one of the most popular wedding rings for men. Tungsten rings have many advantages over traditional wedding rings or bands made from platinum, gold or silver. We will look at some of these differences and highlight the benefits of tungsten carbide wedding rings for the man in your life. A common concern for many considering a wedding band made from tungsten is that it will not be able to be removed easily in case of an emergency. This myth abated when doctors and jewelry shops spoke out debunking this myth. Tungsten bands are designed to break under the correct pressure and emergency rooms and jewelers are equipped with the equipment to facilitate such a removal without harm to the wearer. In fact, tungsten carbide wedding bands are considered to be safer than a band made from softer metal because tungsten bands do not bend. In a critical moment the band will break into pieces rather than bending and applying painful pressure or causing further damage, such as gold tends to do. Tungsten carbide wedding bands are growing quickly in the bridal jewelry industry due to the strength of the metals and its considerable resistance to being scratched or dented. The rings are roughly 10 times harder than 18k gold and 4 times harder than titanium. On the hardness scale for metals, gold ranks 2, tungsten 8, and diamonds 10. 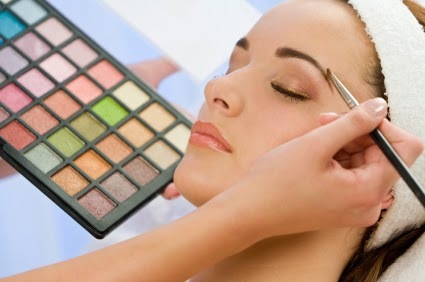 In addition to its classy look and high polish many men are attracted to its technical nature. Men who work with their hands usually do not want to wear rings that will easily be pitted or scratched. Tungsten will maintain its luster and look even with the most challenging professions. Many men in construction, woodworking, plumbing, or any profession that relies on using one’s hands, prefer these rings for their manly nature and endurance to what is thrown at them. Allergies have also caused many men to forgo wearing a wedding band and caused the wives sadness that their husband cannot enjoy the ring that symbolizes their union. Tungsten alloy is special and valuable due to the hypoallergenic nature of the metal. Those with allergies to gold, silver, or nickel will be able to wear these rings and enjoy having them as their status symbols like the rest of the world. The jewelry industry enjoys putting certain metals on a pedestal, but the reality is that any metal that you choose to symbolize your love is valuable. Unfortunately, this myth is true. Tungsten wedding bands cannot be resized in case your finger size changes. However, many people never find a need to have their wedding bands resized. My parents have had their original wedding bands for 30 years. If you did find yourself in the position of needing a smaller or larger size, you will need to order a new ring. The best bet is to purchase your rings from a jewelry site that has a lifetime guarantee on their rings, which fortunately, http://uniquetungstenrings.com has! To find your ring size, please use our RING SIZE FINDER document. Download the Amazon Ring Size Finder PDF file, print it and follow the instructions. However, for the most accurate ring size measurements, visit any jeweler and have them size your finger and then use those measurements when ordering. We at http://uniquetungstenrings.com have a guarantee that if your ring does not fit you can send it back for one that does! 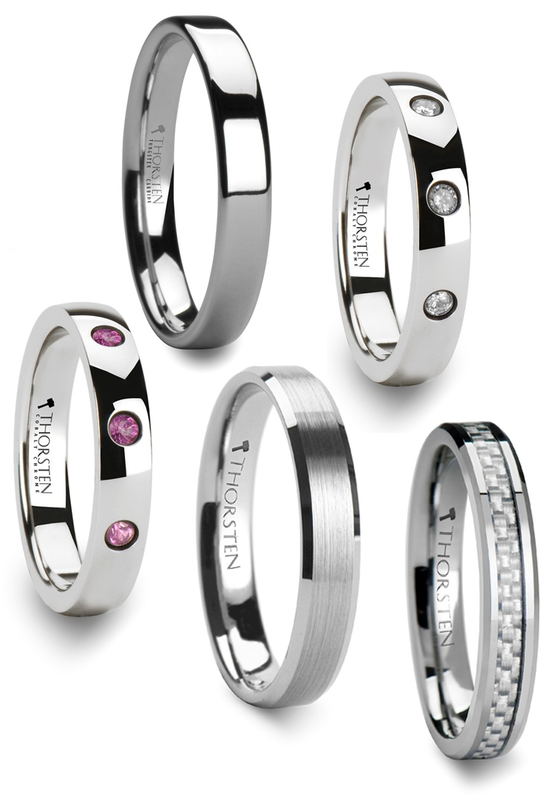 In Conclusion – Why choose Tungsten for your wedding band? 1. Tungsten rings are affordable! In this economy, more people are becoming practical with their selections and not turning to traditional overpriced metals. 2. Tungsten is the most durable precious metal for those who work with their hands. 3. Tungsten rings maintain their shape and polish, even under the most intense pressure. 4. Tungsten rings do not scratch; thus will not need frequent polishing to stay classy looking. 5. Tungsten Carbide is heavier than most metals because of its density and feels solid. 6. Tungsten rings are hypoallergenic. 7. Tungsten weddings bands will not tarnish or turn your finger green. 8. Tungsten wedding bands are as unique as you and come with a wide selection of colors and unique inlay options. 9. In case of an emergency, tungsten rings will not cause additional or further damage to the wearer’s hand. 10. On your 80th anniversary your tungsten wedding ring will still look new! Tungsten carbide rings are known for their durability. It’s why so many people choose to have these rings. They are scratch resistant, do not fade, or tarnish no matter how much of a battering you subject them to. There’s no way better to demonstrate your eternal love for someone on your wedding day. The main drawback of such a high level of durability is the fact they can’t be re-sized. If you happen to lose or gain weight, you might have to get your ring replaced. 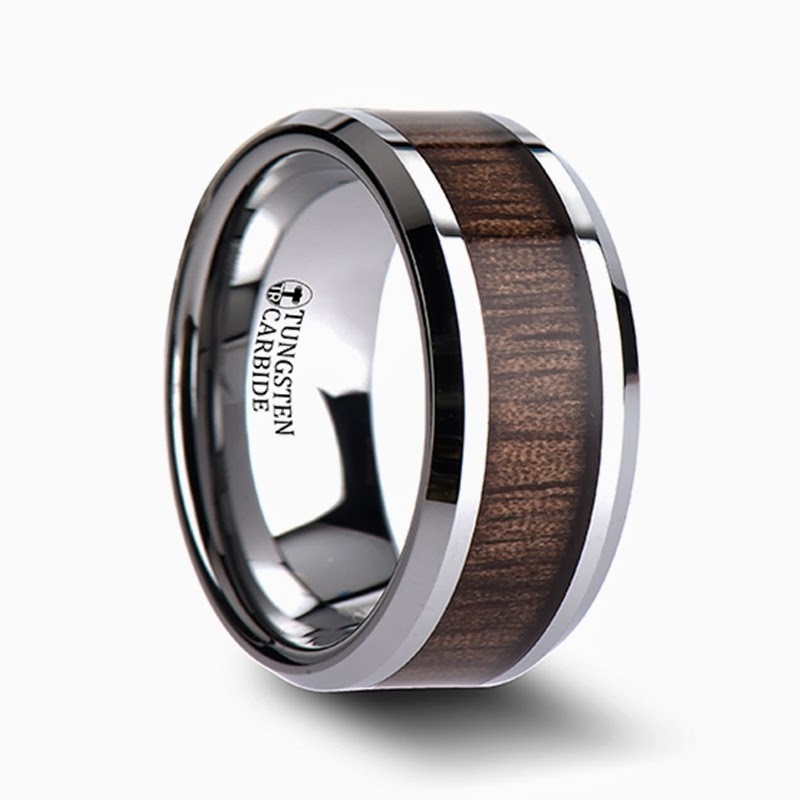 Tungsten carbide has a rating of 8 out of 10 on the Moh’s hardness scale. To put that in perspective, an 18k gold ring has a rating of 2 and diamond has the maximum hardness rating of 10. Many jewelry sites mention that tungsten rings can be up to ten times as hard as an average gold ring, and four times harder than titanium. It also has a very high melting temperature of 6170 degrees Fahrenheit. Since the only way to change a tungsten ring after it’s been made is to melt it, there’s no chance of retaining the same decorative qualities as before. Assuming that the ring is simple and without any customization, it would still be impractical. The cost required to produce these temperatures would be so high it would be cheaper to simply purchase another ring. In the absence of any other options, re-sizing isn’t worth it. You also have to consider additional alloys. We’re only talking of tungsten itself when we refer to the hardness of the metal. You can’t combine an alloy and a base metal and reduce it back into a workable alloy and base metal again. Add in treatments like cobalt and all you’ll get is one big mess. In many cases, the reaction that takes place in the furnace is irreversible. The easiest way to avoid the problem of having to re-size your ring is to place a custom order. Have your ring finger professionally measured and place an order for this size of ring. Now you’ll know your ring will be of the correct size. Make sure you never place a custom order if your weight is in a change of flux. If you go on a diet after ordering your ring. Jewelers do other warranties on re-sizing. If you ever need to re-size your ring, your warranty will cover the purchase of a new ring. Order online and you’ll have to send the ring back to the retailer. They’ll send a new ring to you. Your old ring will most likely be resold on the second-hand market. Not all jewelers offer these warranties, and many will carry an additional charge. However, since you already found us, you won’t have to worry about any of the things mentioned above, because uniquetungstenrings.com provides a top of the line lifetime manufacturer’s warranty and lifetime free size exchanges with each and every ring. Silver, gold, and platinum are classics, but if you’re considering wedding bands or want a ring to truly symbolize your personality, then a Tungsten ring might be the right option for you. Tungsten carbide rings (more commonly referred to simply as “tungsten”) are a gorgeous choice that lasts a lifetime and allow those who wear them to distinguish themselves with truly phenomenal jewelry designs. With a beautiful weight that their fans love for its character and an occasional reminder of a ring’s presence to its wearer, tungsten is an outstanding choice for wedding bands. Harder than more traditional options and even stronger than titanium, tungsten rings are great for active lifestyles and long wear. Few natural substances other than diamonds themselves have the ability to mar tungsten, so it’s a safe bet for jewelry-- like wedding bands-- that you are certain to wear day in and day out. Warm water and mild soap combine to make the best cleaning solution for tungsten. Avoid chemicals, bleaches, and traditional jewelry cleaners that may damage the finish of your tungsten ring, by sticking with the basics. You’ll love how well simple soap and water work on your wedding band and that there is no need to buy an expensive cleaner to keep it in tip-top condition. If your ring is ever exposed to harsher chemicals, it’s best to wash it with soap and warm water as soon as possible. Buff your ring using a soft cloth dipped in the soap and water solution. For best results, wash your ring with a soft cloth—many prefer cotton or micro fiber—and buff to create a soapy lather and remove any dirt or debris from your ring. The process takes only minutes and your ring will look as good as new with just a little elbow grease! Rinse well and dry for the grand finale. Rinse your ring in clear, warm water and dry with a separate, soft cloth to enjoy the original finish of your jewelry. Always wash your ring by hand. Your tungsten ring won’t require frequent cleanings and should always be washed by hand, never tumbled or put into any sort of ultrasonic cleaning machine, as tempting as that may be. Tumbling your ring may result in undesirable effects on the finish and strength of your ring. When you choose a tungsten ring for your wedding band, you’re choosing a beautiful, high quality material that will last much longer than those traditional precious metal rings you see on left hands around the world. Take good care of your tungsten wedding band and enjoy not only its unique characters, but its own timeless qualities of strength and resilience. Use your network. Take a moment to think about all those talented and gifted people in your life—the ones you will likely invite to your wedding—and what they do both for a living, and in their spare time. Is there an amateur photographer or DJ in your midst? Does your best friend love to decorate? 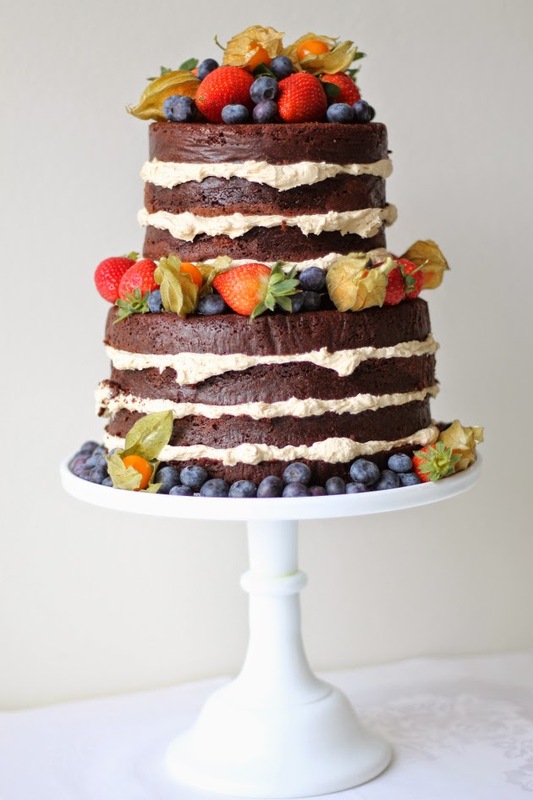 Does the groom’s mom pride herself on her baking abilities? It’s time to put those talents to use! Make a list of all the products and services you will absolutely need for your big day, and then scan the guest list to see who might be able to provide. Explain to those folks from whom you make special requests that you are on a budget, and offer to pay up --but ask if they might give you a discount as their wedding gift to you. You may be surprised at just how generous those who want to share your special day will be. Keep it intimate and comfortable. Your wedding is about you and your significant other, so keep guest lists small and invite only close friends and family, then choose inexpensive but fun favors and a few great comfort foods to share with your guests. Choose to spend your big day with the people you care about the most and plan a time they can enjoy, and you’ll save money in the process while eliminating all the potential stress that can come with dramatic wedding guests or too-fancy food choices that never turn out quite the way they were meant to. Go against the grain. Choose an off-peak date and time for your wedding. Once you know the geographic location of your wedding, check with vendors to see when their slower times of the year occur. They want your business even more when there are fewer couples knocking down their doors, and many will be obliged to offer significant discounts for venue rental, décor, setup and breakdown, etc. Choose a single kind of in-season flowers. Extravagant bouquets can be beautiful, but bouquets crafted from a single type of flower are often nothing short of striking. A timeless option that will make for beautiful photographs and a truly elegant look and feel for your event, bouquets of your favorite in-season flower save money by allowing your florist to buy in bulk at market prices, a savings that will be passed on to you in total décor savings. Keep your eyes open for great deals and enjoy the wedding planning process. For many people, this is an once-in-a-lifetime shot at making memories that will last forever. Be true to your personality and budget and start your new life together off on the right foot. As odd as it may seem, an increasing amount of couples are choosing to divert from the traditional regal icing or the creamy butter icing to top their wedding cake with. In fact, they’re shying away from any icing at all. Instead, they’re taking a more simple route and choosing to serve simple sponge and filling. While this idea may seem odd at first, it’s actually incredibly beautiful and never fails to make the mouth water. This design shows off the glorious layers of sponge, curd, jam and buttercream inside the cake, flaunting them for all the guests to see. You’d be hard pressed to call this style of cake plain either seeing as they’re usually generously decorated with fresh fruit or flowers, adding to the natural look. Of course, we’re no doubt all familiar about what a statement cake is, they’re pretty hard to miss and impossible to forget after all. They’re a great choice for any wedding and will make a great talking piece to make the day truly unforgettable for your guests. Year after year, cakes are becoming ever more flamboyant as baking becomes more of an art than a talent, making for some tremendous cakes. Some are intricate sculptures, some seemingly defy gravity while others are statuesque wonders. While some happy couples are opting for cakes with no icing and others are opting for cakes that can be classed as works or art, others are choosing to host their reception with no cake at all. Instead, many couples are breaking from tradition and and are replacing the usual centrepiece with a vast table, filled with various sweet treats. These dessert tables are often made up of fine chocolates, cupcakes, home-made sweets and most anything else the bride and groom think people may fancy. 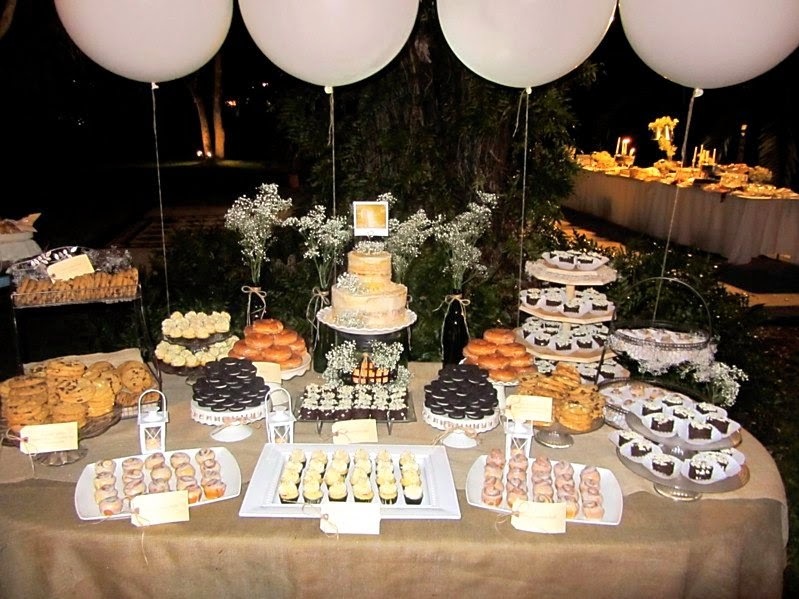 Dessert tables may seem odd at first but in fact they’re often much less costly to set up than a traditional cake and much more likely to cater to everyone’s tastes. While these three wedding cake trends may well be at the very height of style as we enter 2014, it’s worth pointing out that they are merely the tip of the iceberg. 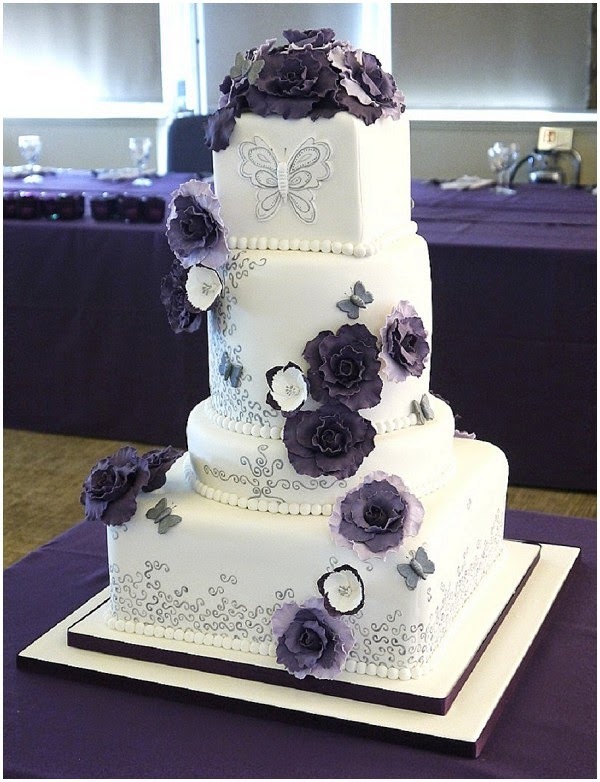 Each wedding cake designer can offer couples something completely different, something suited to their unique tastes and personalities, thus it’s rare that any two wedding cakes are the same. Remember that choosing your wedding cake is all about personal taste, not what’s in style or what’s traditional, so be as imaginative as you can. You probably thought that when you chose your wedding gown the hard part was over. Think again. While your wedding dress may be by far the most important item you need to get right on your wedding day, it doesn’t mean that everything that goes with it is no less important. You can spend endless hours choosing your wedding dress but ultimately if you accessorise it wrong your whole look may be spoiled. When it comes to choosing your wedding jewelry, your shoes and anything else you’re planning on walking down the aisle in, it’s important to remember that your accessories should be an extension of your personality and the dress itself, not a distraction from them. You don’t want to overwhelm your dress. Scoop-neck and V-neck dresses are great because they allow you to wear virtually any type of necklace, without spoiling your look. Delicate pendants, strings of pearls, embellished chokers, the choice is yours. If you’re wearing this style of dress however it’s advised you stay away from any neckwear that’s too chunky or heavy as this can easily overpower the delicacy of your dress. Necklaces are best avoided if you’re wearing a halter and high-neck dress but that doesn’t mean you can’t compromise. If this is the style of your dress, you’d be better accessorizing it with a pair of statement earrings, thus not taking away from your beautiful gown or clashing with it but still adding a bit of sparkle. To keep your look consistent, it’s important that you stick to just one color of jewelry whether it’s gold, silver or rose. When choosing which color to go with, consider the color of your wedding band. It’s the most important piece of jewelry you’ll ever wear so it makes sense that your other accessories should match in color, thus complimenting it instead of clashing with it. Every bride wants to look flawless on her special day and one of the most effective ways to do this is by highlighting your best features with accessories. If your face is your best feature, be it because of your smile or your sparkling eyes, go for a pair of delicate yet eye-catching earrings. Perhaps your bust is your best feature? If so, following your neckline as outlined above is a sure way to highlight your assists. Whatever feature you’d like to accentuate, you can do so by focussing on the piece of jewelry that sit’s closest to it. Be sure to choose something eye-catching yet petite so you won’t overpower the feature and you’ll find yourself looking dazzling. Of course, every bride is different and will have her own unique, personal tastes when it comes to accessorizing her wedding gown and what suits some may not compliment others. When it comes to choosing the jewelry for your own special day, remember to be true to yourself. After all, it needs to feel right as well as look right when you’re wearing it. Take your time when choosing and enjoy it, you only get to do this once after all. Romantic, beautiful, memorable and scenic - there’s no denying that an outdoor wedding captures all these traits and many more. If they’re organized right, outdoor weddings can be absolutely stunning. Imagine taking your vows before the glowing sunset or dancing beneath the stars, it really does make for a wonderful picture. 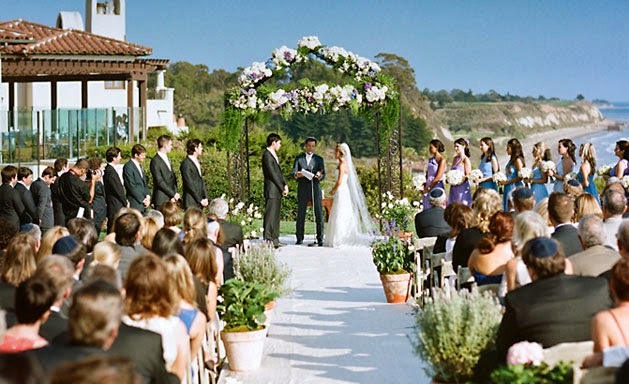 If they’re organized wrong however, outdoor weddings can quickly turn from a dream to a nightmare so it’s important that you follow these simple dos and don’ts to ensure that all goes to plan and you get the celebrate the wedding of your dreams. A big pro for outdoor weddings is that couples often save themselves a small fortune in decoration bills. Perhaps the venue has a picturesque mountain behind it or perhaps it’s a garden lined with flowers in bloom. While the venue may already look fabulous, it’s vital that you don’t forget to decorate however. While this may not mean the same as it would for an inside wedding, it’s still worth considering. Visit your venue a week before you wedding day to see if anything needs done. Do you need to line the trees with lights for nighttime? Are the flowers in bloom or starting to wilt and do you need more? Has the grass been mowed? Will the venue do this for you? These are all simple questions but make a big difference come your special day. If you’re to be wed in a public space such as a local park or beach, you should always contact your local authority to check if you’re allowed to do so and if you require a permit to go ahead. While you’re looking into these details, you should also ask about the rules concerning photography of the location, lighting fires and candles, bringing electric lighting and setting up marquees or tents. It goes without saying that if you’re planning and outdoor wedding your keeping your fingers crossed for sunshine. A bright sunny day will allow you to snap some fabulous pictures and will make the day even more enjoyable for you and your guests. When you’re relying on the sun, you need to think about more than just the weather forecast however. It’s vital that you consider the suns position during your wedding. You don’t want your guests to be blinded by the sun so they can’t see you take your vows so seat them with their backs towards it. 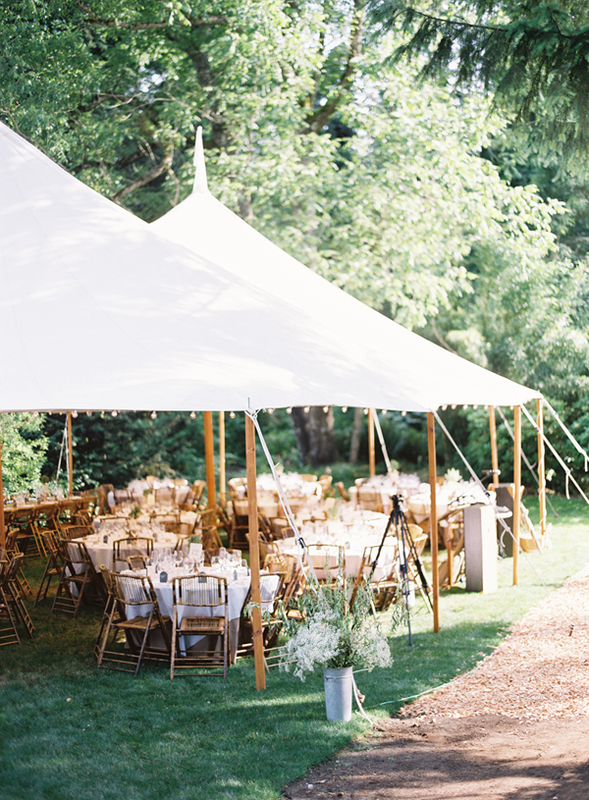 The most important thing to consider when planning an outdoor wedding is your backup plan. Firstly, make sure you have one. Consider all the things that could go wrong, namely the weather. What will you do in the case of rain or terribly strong winds. Make sure you have either a marquee you can set up for such an event or, if possible, ask whether your venue will allow you to celebrate indoors should the weather be adverse. These dos and don’ts may be simple but all too often they’re overlooked in the stress of planning. Take just a minute to consider all of them and you’ll find your wedding is as memorable and perfect as ever. With all the stress and excitement that comes with planning a wedding, no doubt when it’s over you and your other half will be looking forward to simply taking some time to yourselves and relaxing. What better way to do just that than to jet off on a fabulous honeymoon as Mr. and Mrs? In it’s own way, planning a honeymoon can be just a stressful as planning the wedding, especially you and your other half have different ideas on where to go and what to do. To help you choose your perfect honeymoon, here’s some ideas to get you thinking and some suggestions to make it the escape of a lifetime. Okay, so this suggestion may not exactly help you unwind after all the stress of planning your big day but it will certainly make for an unforgettable honeymoon. What could be more exciting than starting off the adventure that is marriage by going on a real life adventure? You could do anything, there are so many amazing options out there. You could dare a safari through the plains for Kenya, hike to Machu Pichu or explore the great rain forests. Don’t be put off by the lack of relaxation these holidays provide either - just because you’re going on an adventure doesn’t mean you can’t have the best of both worlds. You can still stay each night in a luxury 5 star hotel before you set out each morning. them plenty of time to unwind, relax, soak up the sun and enjoy each others’ company. Hitting the beach means couples get to spend their first few weeks of married life walking on glorious white sands, swimming in aqua blue waters and soaking up the blissful heat. Greece, Mexico, Egypt, Australia - the choices are endless! And here’s a neat little tip: there are lots of hotels out there that cater for adults only so be sure to ask your travel agent to ensure you escape to absolute, quiet bliss. great way for couple to soak up the culture, try some foreign foods, see some local wonders while adjusting the married life in style. A weekend city break can be relatively cheap, something many couples are looking for after the costs of the wedding are paid, so it’s a great option for newly weds. If you and your partner are city lovers, you might also consider purchasing a rail ticket that allows you to city-hop for a time too. It’s a great way to see more of the world while never leaving the convenience of a city behind. 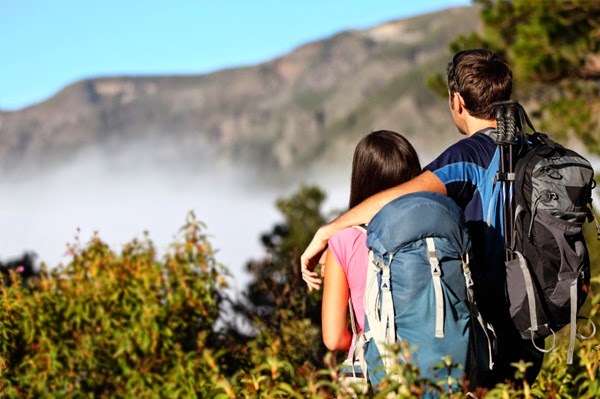 Honeymoons really are a personal affair so, when choosing where to go, all that matters is what you and your partner would like to do and experience. And remember, your honeymoon is under no circumstance an ordinary vacation. You only get to do it once so make sure to indulge yourselves and enjoy every second of it. More and more people are choosing tungsten as the material for their wedding rings. Indeed, it is becoming so popular that it is overtaking the more traditional gold material, and even the more modern materials like titanium or platinum. But just what is tungsten? What are its characteristics? First of all, you must learn to understand the material that is tungsten. "Tungsten Carbide is a warm gray-toned metal usually with a high polished finish. Tungsten Carbide is scratch resistant through normal wear and consistently looks new and polished throughout time. It is a heavy metal, more so than its Gold and Platinum counterparts. It is the hardest metal in the world that is used for jewelry." It is stronger than any other material out there and it is also one of the most durable. Indeed, the only material that compares to it in terms of durability is a diamond. Added to this is the fact that it never loses its shine and this makes it incredibly popular for a wedding ring, in particular for men who often use their hands more than women. The key to tungsten is its strength and it really is unsurpassed. "Tungsten rings are durable enough for every-day use and keep their original polish and luster for life. Tungsten carbide can only be scratched or damaged by extreme measures, like abrasion from diamonds or corundum." It is for this reason that they are so popular. There is literally nothing you can do to cause scratches on the material of your ring. It will last a lifetime, and many people are choosing these rings because they can become family heirlooms over time. A lot of people still choose titanium over tungsten due to the fact that titanium is so lightweight. Indeed, tungsten is not as light, but this doesn't mean you will have an unmanageable weight on your finger either. "Tungsten is known for its weight. In many of its applications, the weight of tungsten is one of its more beneficial characteristics. Tungsten rings for men and tungsten wedding bands are no different." At the same time, it is heavy enough to make you realize that you are wearing a ring. For some people, this is a drawback. For others, however, it is further testament to the sanctity of marriage, something that literally weighs heavily on their hearts and minds. Tungsten is generally not hypoallergenic. This is due to the fact that they often include cobalt in the material. However, more and more jewelers are now choosing to use nickel instead, which has the same properties but is hypoallergenic. It is very important to speak to a jeweler and ask about whether cobalt or nickel is used. If they don't know, you can assume with some certainty that it will be cobalt, which means that you may not be able to wear it if you suffer from allergies. Finally, one of the greatest characteristics of tungsten is the price. It is a much cheaper material than the traditional gold or platinum. Silver and titanium are generally not too expensive either, but tungsten tends to be the cheapest of the lot. This does not, by any means, mean that it is a cheap and tacky material, however. Indeed, tungsten is absolutely beautiful in its shine, and as technology progresses, various other inlays and insets can be added to make it even more beautiful. For instance, if you want something that is both completely unique and completely affordable, you could choose a tungsten and ceramic ring. Very few others will have something like this. Are Tungsten Carbide Rings Hypoallergenic? Tungsten carbide, often just called tungsten, is an exciting jewelry material that is gaining in popularity. The metal was identified in the last half of the 1700’s, and has been used in industry, ammunition and medicine for over a century. Just over 20 years ago, designers recognized its jewelry potential and it became available to the general public. Tungsten is one of the strongest metals around. It is stiffer than steel, denser than titanium, and 10 times harder than 18K gold. Only diamonds or similarly super hard substances can be used to successfully finish and polish it, which means it is exceptionally resistant to scratching. Once polished, it will remain brilliant forever, and won’t tarnish. Its strength and durability make it particularly well suited for use as rings. Initially, tungsten rings were primarily marketed to men and sold as wedding bands because they did provided comfortable, everyday wear that also looked great. Now there are wedding sets made of tungsten, and other ring designs for women to enjoy the same features. Another area where tungsten excels is cost. Tungsten can cost 10 times less than similar designs in platinum. They are always hundreds of dollars less than gold and can even be cheaper than silver. The outstanding wear and low cost combined with recent global financial concerns has caused the demand for these rings to skyrocket. No longer seen as an edgy alternative, tungsten is often seen as the smart choice. Naturally, when it comes to rings and wedding bands consumers still want to compare. Advances in processing now allow tungsten to come in a multitude of colors beyond the traditional gunmetal grey. It can be a stunning black or shining silver that rivals platinum, titanium and white gold. Because it looks like these more expensive options, but costs less and lasts longer, it is often a clear winner. One additional area of comparison that is increasing important to consumers is biocompatibility, or whether or not a ring will cause a reaction in wearers with allergies or sensitivities. Most metals used in rings are alloys, or combinations of various materials. Pure, or 24K, gold is one exception. Combining metals allows jewelers to craft items with desired qualities like color, malleability, durability, harness or shine. Most people who have allergic reactions are reacting to one of the elements that the alloy is comprised of. For example, white gold is often crafted using nickel. It is estimated that up to 10% of the female population and 1% of the male population suffer from nickel allergies. These people would likely have some sort of reaction to white gold. Tungsten carbide is actually 50% tungsten and 50% carbon. It can be mixed with different metals to mitigate features like brittleness. It can cause a reaction if it is mixed with cobalt. Cobalt can cause oxidation and skin reactions in some people. Anyone who suffers from cobalt sensitivity should first ensure their tungsten rings do not contain these materials. Tungsten carbide rings and stainless steel rings have both gained in popularity since people started to look beyond traditional gold rings. Whether you’re looking for a ring for a special occasion or just because you want something new for your wardrobe, these are two of the most desirable rings amongst men and women. Which ring should you choose, though? Both rings are difficult to scratch. It takes a hard material to cause any serious damage to either one. The steel ring will start to dull over time, though. Plus, it’s slightly less scratch resistant than the tungsten ring. The only material harder than tungsten (for a ring) is diamond. And it never loses any of its sheen. If you have to get rid of the ring quickly for any reason, steel comes off best. Tungsten rings can’t be cut off. They’re so tough that only a diamond cutter would work. Instead, you’ll have to crack it and cause it to shatter, and thus ruining the ring completely. You can’t resize a stainless steel or tungsten ring. They’re too tough to be resized easily, and it would be impossible to preserve any decoration. In fact, it would cost so much to resize either of these rings that it would be cheaper to simply buy a new one. Look into resizing warranties in case you do need to change your ring size. Many online and land-based jewelers offer them these days. Some people have allergies to specific metals. With tungsten, you’ll have no such problems. It’s a completely inert substance that won’t react to skin or anything else. Steel rings can cause allergic reactions if they contain nickel. If you have a nickel allergy, make sure you buy a ring that doesn’t use nickel. For example: White Tungsten Rings. Tungsten rings are much heavier than stainless steel, but they are comfortable. An often forgotten aspect of comparing rings is actually finding a ring from a jeweler. Stainless steel rings are more difficult to find because there wasn’t much demand for them until recently. Consequently, a lot of jewelers don’t sell them. Since tungsten rings are little more expensive, you’re more likely to find them in the window of your local jeweler. Stainless steel rings don’t command the same price, so a lot of the high-end stores simply aren’t interested in them. If you’re purchasing a ring for a wedding, always stick with tungsten. No woman has ever dreamt about her wedding day and imagined a piece of steel wrapped around your finger. It also won’t win you any recognition with the girl’s parents. Tungsten is more socially acceptable because the cost demonstrates how much you value the event. In many ways, tungsten also shows your commitment to the relationship due to how durable it is. Overall, whilst stainless steel does have its place, tungsten is always the best ring to have if you happen to have the money available.